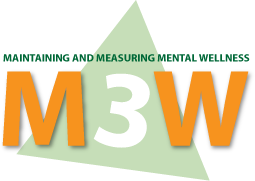 M3W project attempts to utilise the fact that on-line games are able to collect behavioural data in order to measure mental (and motor) abilities and especially their changes over time. If we can measure states and state changes in a scientifically sound way and a strictly controlled environment then we can provide better and more help in time for the elderly and their families. The main objective of the project is to develop a mental wellness toolset for self-usage (i.e. for the individuals and their families), and to a lesser extent for the medical experts (psychiatrists, psychologists, carers, etc.). The goal is to measure and visualise mental changes, tendencies in an entertaining way, and to give indications, sort of warnings, alarms or reports, to the effected persons and their relatives, friends that it is advisable to visit a physician. Our ambition is to compare one’s mental wellness to his/her own past mental wellness conditions (in relative values), while it is not our aim to compare one’s mental ability to others’ one. ICT & web technologies should be used out maximally. Develop a mental wellness toolset for self-usage, specifically computer games, tailored for elderly people. Measure and visualise mental changes and tendencies by an entertaining way. Give indications (warnings, alarms, reports) to elderly persons, relatives, friends or carers. Develop scientifically sound methodology for the measurement and data evaluation. Build multinational mental wellness community backed with multilingual website. Create multilingual content for the mental-wellness multinational community. The earlier one recognises a negative change in his/her own mind or his/her relative’s mental ability the higher the chance is to stop, delay or slow down the speed of health weakening. Regular self-monitoring of elderly person’s mental wellness may extend the time of active and joyful participation in life. Elderly people will be longer active and in contacts with others in their environment. Families will enjoy the toolset that could help them to recognise alarming changes in their relatives’ mind. The project should bring improvements to the quality of life of individuals, their relatives and friends, and thus the quality of life in the whole society will develop.